I’ve been following the Medical Medium Protocol for around 4 months now (first post is here). 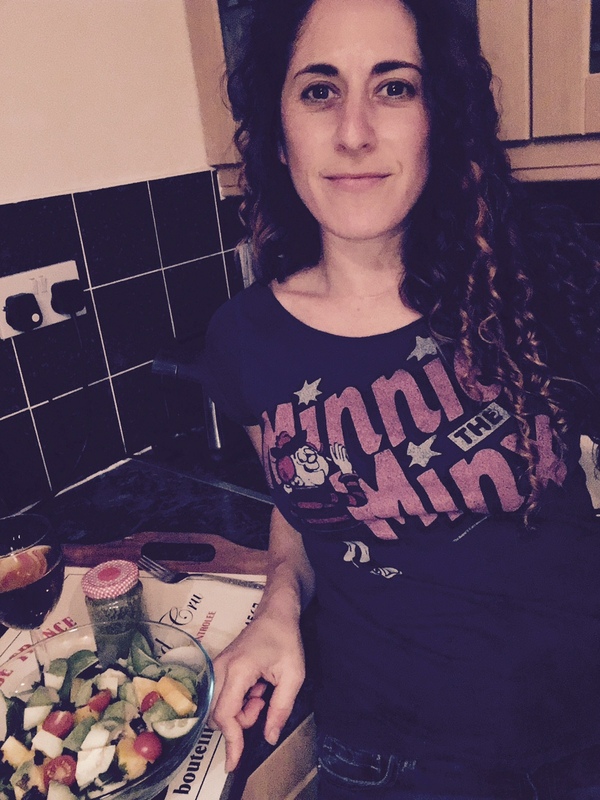 Seeing as I think, breathe and live this protocol I thought I’d give you a little update, share my passion, and for any other devotees out there, share my tips for how to do normal life whilst on a significantly limited diet and whilst managing various schedules of juices, smoothies, teas and tablets. I sincerely believe in Anthony William and many people are reporting success in healing themselves. I intend to be one of them! I am completely dedicated to doing it the best I can because nothing is more important to me than my healing. I want a miracle. I want to prove the medics wrong – that it IS possible to heal hearing loss. And most of all I want to save my life (and hopefully one day others)..because I don’t want to live without hearing. But I guess no matter how strong my faith and determination to succeed, in the end I will only be able to judge the protocol by the physical results. There are no guarantees it will work for me and it’s certainly not going to be a quick fix or easy journey. This is life changing stuff. Not only am I learning to live with disability, but I’m also managing a raw till 4, gluten-corn-soy-free vegan diet! Despite the challenges I aim to continue until I am either well again, or until am bankrupt by herbs, powders and vitamins and have to give up! Unfortunately I can’t report any miracles yet and my hearing seems to have dropped again, much to my silent despair. In general I feel pretty good. Considering that I’m now back at work full time, learning lip reading and sign language, developing my therapy business and doing more work with clients, I’ve got good energy levels considering. People say I look well even though I’ve put on a little weight from nuts and less exercise. The best judge I think is our emotions, and I’ve been feeling positive and clear-headed most of the time. Sudden hearing loss is due to Epstein-Barr Virus (EBV) getting in the labyrinth of the inner ear. Many people are affected by this. Having your zinc and Vitamin C reserves built up is necessary for what you’re dealing with. Spirit recommends taking the liquid zinc sulfate and Liposomal C). The right B12 (with adenosylcobalamin and methylcobalamin) is also imperative for the nerve damage, as is eating frozen wild blueberries every day if possible. CoEnzyme Q10 and Alpha Lipoic Acid (ALA) are also critical. Spirit suggests you focus on praying to some of the angels in the book to help you with the hearing loss. Angels are very helpful for this specific problem, so it’s important to work with them. It’s also very helpful for you to get a little bit of sun on the side of the head and on the ear where the hearing loss is. Not too much sun, just a few minutes a day is good. This will be helpful in restoring the hearing loss. I don’t want everyone reading this to assume they need these the same supplements as me because his advice is personalised for the individual, but these do seem to be the ‘go to’ supplements for EBV issues. 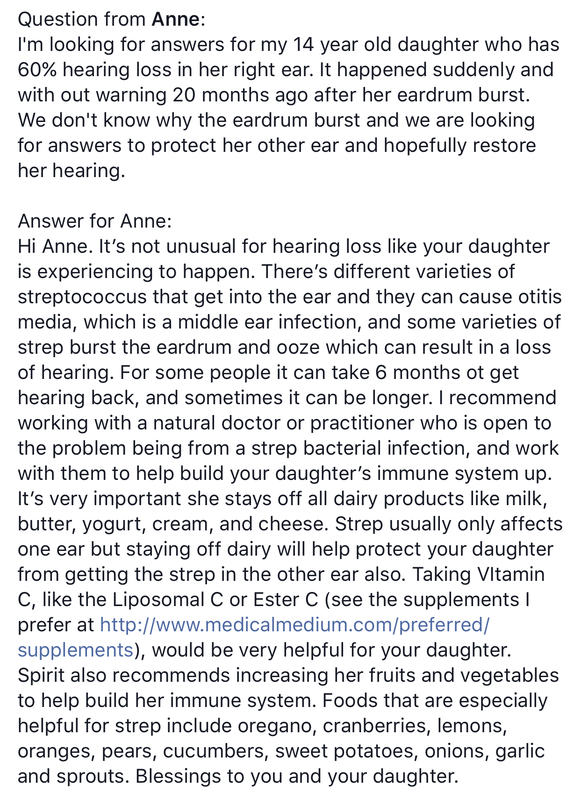 But in another case of sudden deafness, Anthony had a different response, indicating it is not always EBV in the labyrinth but Strep bacteria. With 10,000 people on his waiting list, I’ve got a long wait ahead of me for an appointment so in the meantime I had a session with one of his recommended practitioners Muneeza. .
Anthony William recommended practitioner Muneeza said…. My protocol has changed a few times since my last post but below is the latest version which was adapted by the Anthony Williams recommended practitioner. More of the products are the brands recommended by Anthony William. I’ve learned that it really is important to get the right ones and not to cut corners even if the ingredients seem to be the same. Some of the supplements on the last list I posted I would no longer recommend because for instance I’ve discovered that gelatin, which is made from the the worse form of pork sludge, feeds EBV. I was also advised to avoid any form of supplemental calcium which can be found as a filler. Below are all the supplements I’m taking. Please note that I keep a separate page listing all the supplements I’ve found to be the highest quality and best value in the UK. To my knowledge they meet all the criteria for the Anthony William protocol. The UK Supplements for Medical Medium Protocol page is here. …and to think for all of last year I was on the Paleo diet – eating meat! If I’m eating outside of home she told me to phone ahead and check with the chef that there is food available for me and what oils they use. I’m definitely not a fun person to take out for dinner these days! I’ve very much enjoyed the occasional vegan Indian buffet over the past few months but she said even if though I only had the vegan and gluten free dishes, it’s probably cooked with poor quality vegetable oils or thickened with corn starch – which are no no’s. The worse part is that all those gluten free cakes I was treating myself to were most probably made from corn, which is just as bad as wheat. Knowing what to eat is a bit of a minefield. Its been really hard to find wild blueberries in the UK which are essential to the protocol….until I discovered that they are actually called BILBERRIES!! Anthony recommends eating these daily – either fresh dried or frozen. They are a crucial element of the metal detoxification part. Don’t forget, you need to buy the ones without citric acid or sugar. I found these here. “Has she totally lost the plot?” I hear you say (with my half functioning ears). As you can see it isn’t for the faint hearted! I call it being ‘determined to do the very best for myself’ and besides, it feels good to be healthier. A clean diet really does have positive effects on our mental, emotional and physical well-being. I salivate now over strawberries just as much as I used to over a piece of cheesecake.I don’t want to go back to feeling lethargic and brain foggy. If you’re not feeling so good, have chronic or mystery illness, why not give it a go for a few months? Let me know how you get on. I’d love to hear from you if you’re following this protocol. Also join up with the wonderful communities on Facebook (USA and UK/Europe) which are a hive of information and kind and active support. If you would like me to cover any particular aspects of the protocol please let me know. I would love to hear if the protocol has helped you. I recently started this regime as well for Meniere’s and I am praying it will do the trick. This post is my most recent update. The truth of the matter is that this protocol takes time (2-3 years) but my hearing is deteriorating quicker than that. I wish you luck though. I haven’t heard him speak about menieres have you? But he says most vertigo related issues are ebv and or inflammation in the inner ear. The Vegansafe is a tiny bottle (1 fl ox = 30ml) and lasts me about 2 weeks whereas the Metabolics bottles are 100ml each and last ages. Mixing 1:3 parts you will end up with 125 ml of B12 which will last you 3-4 times longer. Hope that clarifies. Hi Candice, im enjoying reading your blog updates. Who was the Medical Medium practitioner you used? and would you recommend them? Hi Craig, all the practitioners recommended by Anthony are listed on his website. I chose Muneeza and I felt she was very easy to talk to and intuitive. I would go to her again. I think you should use your own instinct though as you may be drawn to someone else. I’d love to hear how you get on. I appreciate your followup. I have been doing this for 7 months and my adrenals are better. I find the same problem w/ eating out. So I am more particular about my foods and do more greens/teas and smoothies at home before and after my outing. Hahaha! I appreciate your scheduling. I have been doing the smoothies at breakfast however that makes for such a long morning ritual. Also since I have lost weight, I need the calories. So I am eating more bananas, potatoes and winter squash. Thanks again for all your efforts. You are an inspiration! Yes its a very long morning ritual and some days I do get lazy. I’m the opposite I have been putting on weight, more than ever before. This must be because my liver is sluggish because of the EBV, and maybe that’s worse now because it’s having to process EBV dieback (fingers crossed), EBV by-products or even maybe the high doses of supplements. I would assume that because you have lost weight your liver is restoring its function….wonderful! Have you done the raw cleanse? It seems EBV is responsible for so many illnesses and from what Anthony Williams suggests, this is a human manufactured virus that can come through vaccines. Scary stuff isn’t it – especially considering that vaccination is being made compulsory in some areas. It may be helpful for you and your daughter to get an appointment with one of Anthonys recommended practitioners. If I can help advise on the protocol at all I’d be happy to as I feel I have tonnes of experience now. Thanks for your suggestion. Yes I have tried Helichyrsum oil and have written a blog on it myself here but admittedly I only did one bottle so perhaps didnt stick with it for long enough. I am a newby and still trying to find my way and incorporating the principles in beating this virus thing. I have found ground freeze dried wild blueberries from Finland from a brand called Loove. It says all the nutrients are kept in the process and it taste amazing! Just thought to share this with you! Are you still following the protocol? Have you seen any more improvements? I’ve just come across Anthony Williams and ordered the book. I have “Hashimotos Thyroiditis” aka EBV and just recently my hearing has started deteriorating. Any tips would be helpful!! Thanks! Ive seen a lot of people feel inspired by the diet, and love anthony williams but i have not actually seen one review yet, of someone who has has healed on this diet. Mostly i see healing stories, of raw vegans who felt better when switching to a cooked diet or ketogenic. I am not trying to argue. I googled genuinely trying to find someone who has healed from the diet, but its all people trying it or inspired by it. If he has healed tens of thousands of people where are they all? Hey Emily, The best place to get involved and see peoples progress is on the facebook groups. Reclaimers of Health is a good one in the US but there are dozens more, just search fro Medical Medium in ‘groups’. I see plenty people reporting their progress on there. Yesterday I read that someone with thyroid nodules went back to their endocrinologist and the nodules have completely disappeared. That was after one year of the program! Have you tried dates? I love those as a snack or a treat. This protocol is, in my opinion, easiest if you hire someone to do all the prep for you so you don’t have to live in the kitchen. I have thought about it a lot. A chef or someone from a catering company would come first thing in the morning and prepare raw dishes for the day and put them in the fridge. Or he could prepare just specific stuff like snacks. It’s a no brainer food but it’s important you don’t have to do so much prep yourself. That’s what burns you out. You want to go somewhere for several hours on this protocol? You have to prepare the take-out food. Yeah yeah I know. That’s not big of a deal, you prepare food for your family every day…right? The biggest issue with this protocol is that you can’t get ahead. It’s impossible to save time without paying heavily. If you do a bigger batch it will just take longer PLUS stuff doesn’t last since it’s all fresh and raw. It’s either time or money. If you choose time and only time you will hate the regimen but do it anyway because there is no better alternative which will either make you bitter (if there is fear behind it, preventing you from cheating) or cheat with the no foods. Yes I live off dates! Batch prep doesn’t work well for salads and stuff. There are ways you just have to be very organised. Only recently have I heard of Anthony William. Have actually done same intuitively over many years! About 16 years ago I had almost complete hearing loss and vertigo. I was a medical transcriptionist too and that also stressed out my brain/ears. I was one of those people who also had the mercury removed from my mouth without doing the proper detox. My hearing did come back after about a year of going off dairy and gluten, two staples as a vegetarian. I eventually had to have my bad teeth removed too, which took years more. Now 67 i have flax seed green smoothies, steamed roots and crucifers and some finely chopped salads with dulse as staples with some canned beans and nongluten grain i prepare only once weekly. Some days eat high fruit, rarely sardines, turkey. Two supplements ..pure synergy multi and pure radiance C. On my own i gave up dairy, gluten, eggs. The corn was the major new food to omit from reading medical medium and it has made a major difference in keeping my sinuses clean and on some tinnutus. From him also learned I had endangered my health through complete and rapid oral mercury removal without detox…. I suspected myself though even back then a viral cause of hearing loss. The pollution of this world paradoxically will cause many of us to become healers..wish I had read medical medium long ago, but not sure it was even out then. My point..do what you can ..it will make a big difference! Donna, this is incredible news! Thank you for sharing. Please tell me, what level was your hearing loss before it returned? Do you have an audiogram? Its really important we capture these success stories. I also agree, that my clients, very often have intuitively been guided towards certain supplements or herbs that their body showed up with Kinesiology. No-one knows your body like you do. You say you threatened your health by removing your amalgams without doing the preparatory detox but it seems as though it didn’t cause you too many problems which was lucky. I am desperate to remove my metal fillings, 2 of which I can see using systematic kinesiology are leaching, and contributing to my problem. But I don’t want to trigger another viral flare up. So awesome that you’re following it so diligently! I support and believe in it 100%! I’ve been having the SAME EXPERIENCES as you and love that I found your blog. I lost hearing completely 2 months ago after a long fight of ups and downs. It’s been really discouraging but I’m hopeful hearing that this could be EBV and not just an auto immune that I have to live with! I’m with ya in this girl, we got it! Let me know how you’re doing NOW! Any progress?? Hi Katie, Thank you for your message. I would love to hear more about what has happened for you. Would you be interested in writing a guest post? It’s quite scary for me to face the possibility of losing all my hearing. How are you getting on? Perhaps we could talk via email? I’ve read just half of this post. Have to rea dthe rest later, but just wanted to say that I am finding this story of your journey to be very compelling.